Height 5 feet 9 inches. Weight 149 lbs. Chest 31-35 inches. Complexion fair. Eyes blue. Hair light brown. Eyes both 6/6. Hearing, colour vision good. Limbs, chest well formed. Full movement of joints. Heart, lungs normal. Teeth fair, small upper plate (2 teeth). Free from hernia, variocele, varicose veins, haemorrhoids, inveterate or contagious skin disease. Vaccinated. Good bodily & mental health. No defects.Mole size of sixpence back of right knee four inches above ankle. Field Ambulance, Zeitoun Camp - gonorrhoea, 18 December 1914 - 3 January 1915. Zeitoun - (? 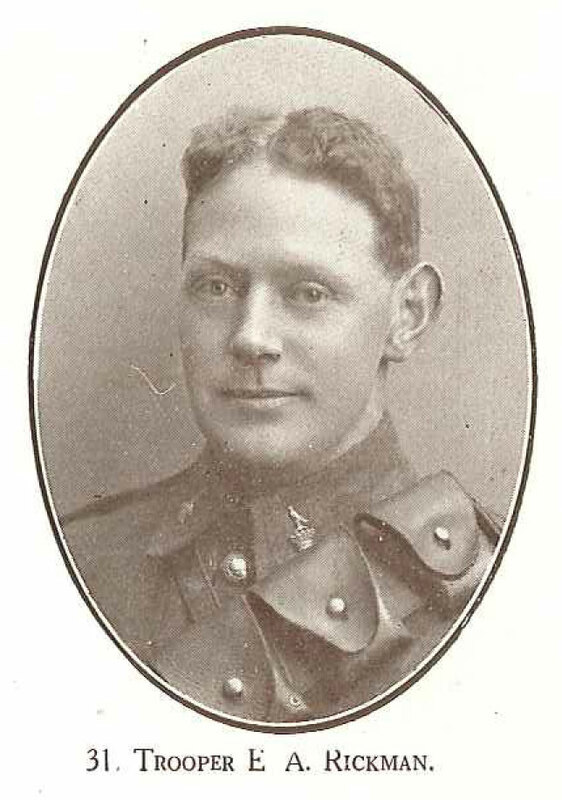 )Pleurodypsia, 19 February 1915 - 21 February 1915. 16th Staty Hosp. - admitted diarrhoea, 17 June 1915 - 2 July 1915. Son of Frank Mardon & Sarah Maria (nee ABBOTT) RICKMAN. Finished schooling in Ashburton. Well known & popular in Ashburton. Was an auction clerk. Keen football, golf & tennis player, a good rider at the hunt. September 1914 appointed lance-corporal.